If you are around the Blackbridge Jubilee Track in Podsmead, Gloucester this weekend why not pop in to watch and support the runners in the 24 hour track race that is taking place to commemorate Dave Dowdle’s 170 mile world record set on this track in 1982 – it still is the U.K. record. 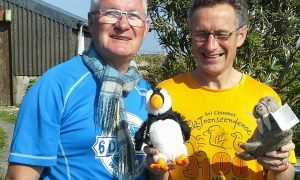 The race will be started by Gloucester MP Richard Graham at 12 noon on Saturday and he will do a lap with Dave Dowdle to help celebrate Dave’s achievement. There are 29 men and 8 female runners, including local hopes Jeremy Mower for Gloucester AC and our own Angie Sadler – who won the event outright in her previous 24 hour track race in Hull a few years ago! 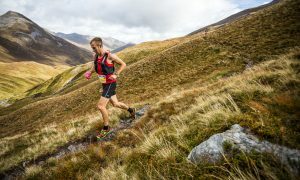 Top runner is England star Steve Holyoak who was the first Briton in the 2013 World and European 24 Hour Championships in 12th place overall (5th European) with a distance of 246.155 kms (nearly 153 miles). At the other end of the age scale, 80 year old Geoff Oliver is hoping to be the first over 80 to record 100 miles in the time (he did it at 79!). I was meant to run but frustratingly have had to withdraw due to painful recurring back injury problems, although I plan to do the first few laps to at least get a ‘distance’ in the results for my entry fee (being a race for the greatest distance covered in a set time rather than a set distance event you actually get a result with only one lap as long as you pass the timing point at least once) and will then be there to support Angie, Jeremy and my business partner Edward in Ed & Phil until the finish at noon on Sunday. Prize presentation is by the Gloucester Council Leader Paul James at the Crypt School about 1pm.